There are plenty of issues within the church over which we can disagree. The doctrine of the Resurrection, however, is not one of those issues. 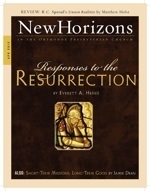 The historicity of the resurrection of Jesus is essential to Christianity. Since elder David Nakhla began his work as the OPC’s first short-term missions and disaster response coordinator in September 2010, he has helped the OPC respond to a devastating tsunami in Japan, unprecedented flooding in upstate New York, and ongoing needs in foreign fields like Haiti and Uruguay. According to Presbyterians, infant baptism is taught in the Bible. But according to Baptists, the Bible teaches that only professing believers should be baptized—and they must be immersed, besides. Why can’t we agree on what the Bible teaches about baptism? Why doesn’t the Bible tell us simply and unmistakably who should be baptized—and how? We could ask such questions about many matters.